James Frederick Evans, or “little Jimmy” as he was known to his nearest and dearest, had been imprisoned for over 3 years now. Trapped inside his little red cell with very little wriggle room. He’d run and jump and play never more. He’d not seen the signs. 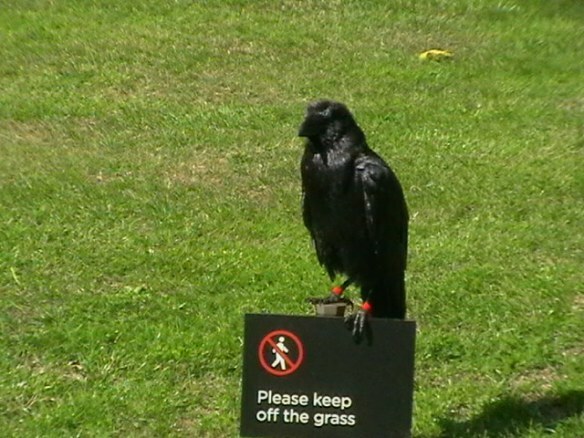 He’d known not to keep off the grass. Known not that the green, green grass was there for visual pleasure only. Not to be felt under foot or hand or ball. It was purely there to be seen and nothing more. Little Jimmy looked out upon the world in envy. The location of the prison his greatest torment. There he was, surrounded as far as the eye could see, by luscious emerald blades. Here he would languish forevermore. Submitted as part of Sunday Photo Fiction. Brilliant 🙂 I wonder of Jimmy has to wait for someone else to be a prisoner so he can get out. There is very little room, so I think you might be right! Who will be first against the wall? Thank you for the lovely comment. LOL. I just had to try another and this one didn’t disappoint. The cat returned only to have to run quickly out the door again from my laughter. While I like your stories, my cat isn’t such a great fan. Very clever story. I’m pleased you decided to go wandering through my blog, I hope you’ll find some more here that tickle your fancy, and terrify your kitty!